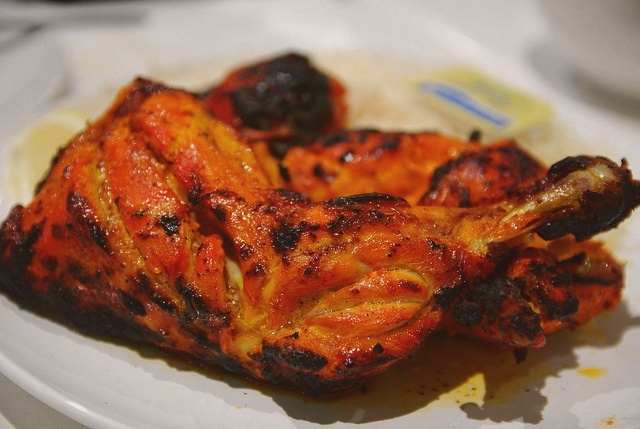 Classic tandoori chicken from India is marinated in yogurt, lemon juice, and plenty of spices, then grilled or broiled. Plan ahead. This recipe needs to marinate at least 8 hours or overnight. Cooking time: 45 minutes. This recipe yeilds 4 servings. In a nonreactive bowl, combine the yogurt, lemon juice or vinegar, garlic, ginger, cumin, ground coriander, cayenne pepper, cardamom, cloves, black pepper and salt. Stir until well-mixed, then pour the mixture over the chicken and rub it into the flesh, turning the chicken several times. Cover and refrigerate 8 hours or overnight. (Do not marinate for longer than 2 days.) Remove the chicken from the refrigerator at least 30 minutes before cooking. Serve with sprigs of cilantro and slices of cucumber, red onion, tomato, and lemon. Thanks a lot for this recipe. It turned out great.delicious dear…You have made this perfectly..Will surely give it a try..